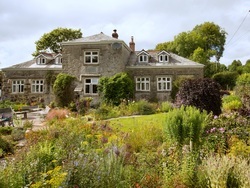 .The Old School House, established as a small B & B in 1992, is a comfortable, Victorian schoolhouse, built in 1838, set in pretty, mature gardens on the edge of the unspoiled moorland village of Cardinham. It was the village school and school house until the current school opened in 1881, since then it has undergone a number of changes until the present owners took it over in 1986. Sympathetically modernised and updated it now offers a comfortable home and a peaceful and relaxing holiday retreat, off the beaten track, although only 1½ miles from the main A30 trunk road. If it is peace and tranquility you are seeking this is the place for you! Cardinham is an ideal base for touring, riding, cycling, walking and bird watching. Places to visit within half-an-hour by car include: The Eden Project, Lost Gardens of Heligan, the National Trust property of Lanhydrock, Bodmin & Wenford Steam Railway, the pretty little port of Fowey, Port Isaac and Padstow, and Wadebridge. Cardinham Woods is ten minutes away offering lovely woodland walks, cycle trails, exciting mountain bike tracks and as well as a the excellent Woods Cafe for delicious home-made lunches and light refreshements. Bodmin Moor is about a mile away with its wonderful scenery, ancient monuments, unspoilt moorland and villages. And we are within easy reach of many of the beautiful Poldark filming locations. If sadly your visit includes Glynn Valley Crematorium we are only about 10 minutes drive away. All accommodation is on the ground floor, there are two rooms: a single with a shower and a double with a bath. The double is in the main house with lovely views across the delightful garden. This room has colour TV with Freesat, refreshment tray with complimentary Furniss biscuits, radio alarm, central heating and en-suite bathroom. The Bothy, is a small very pretty, stone and slate building about five yards from the main house offering single occupancy with a shower en-suite; ideal accommodation for one person wanting privacy. There is no TV in this room but all guests are welcome to relax in the Orangery at the end of a busy day enjoying this lovely unspoilt heart of Cornwall. Both rooms have a refreshment tray. A full English breakfast is served in the Orangery. Local produce is used wherever possible including bacon and sausages, free range eggs, home made bread and preserves. There is off road parking for visitors and guests are invited to enjoy the gardens and watch the abundant bird life. There is free wi-fi access. We can assure guests of a warm welcome and comfortable stay. This is a non-smoking household and we ask guests not to smoke in the house.